KUALA LUMPUR: The Royal Malaysia Police and the Fire and Rescue Department yesterday signed an agreement on the investigation of fires that aims to reduce the duration of the probes and avoid overlapping of tasks. The note on smart cooperation was signed by Inspector-General of Police Tan Sri Mohamad Fuzi Harun and Fire and Rescue Department director-general Datuk Seri Wan Mohd Nor Ibrahim at the Police College here, witnessed by Deputy Prime Minister and Home Minister Datuk Seri Dr Ahmad Zahid Hamidi. The agreement provides for all cases of fire investigation by the police to be handed over to the Fire and Rescue Department effective yesterday. However, if the probe by the Fire and Rescue Department reveals the element of arson, the department would hand a report on the investigation to the police for a further probe. Ahmad Zahid, in his speech at the event, said the note on smart cooperation would have a high impact particularly in terms of reducing the duration of investigations and avoiding the overlapping of tasks by the two agencies. Ahmad Zahid said the collaboration had smashed the barrier of working in silos by the two agencies that had resulted in delays in solving cases of fire investigation. He said the Fire and Rescue Department had started investigations on 3,901 cases of fire over the past three years and the probe on 477 of these cases had been delayed and had yet to be completed. “The Fire and Rescue Department has been depending on the Police, and the Police have been depending on the Fire and Rescue Department. Hopefully, with this collaboration, the investigation of fires can be completed fast. “Conclusive investigations can be conducted; the Police and the Fire and Rescue Department will no longer engage in a tug-of-war on who has more authority or jurisdiction in any case of fire investigation,” he said. 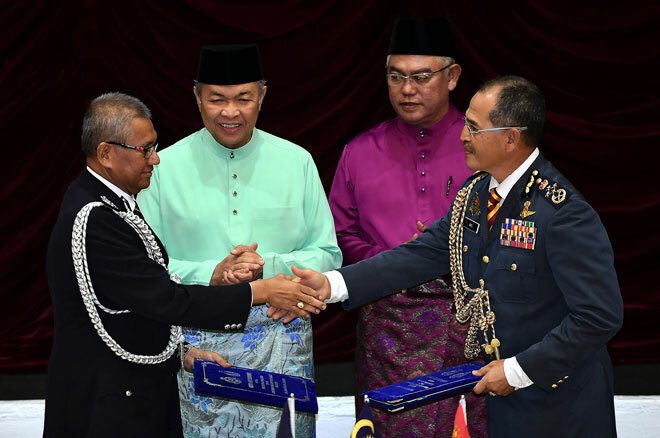 Ahmad Zahid also advised other ministries, departments and agencies to emulate the Police and the Fire and Rescue Department in implementing smart cooperation towards providing better service to the people. On another matter, Ahmad Zahid said he wanted only one individual to be the spokesperson and to issue media statements for all the agencies engaged in disaster management to avoid confusing the people with all kinds of information. “This is to streamline the statements so that the people will not be confused,” he said, adding that official secrets should not be made public.